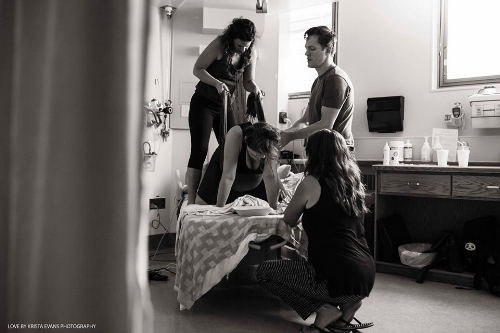 Childbirth is a super intimate, vulnerable, emotional, incredible time. And you should pick very carefully who you want to attend your birth. If you have a partner and they are supportive and with you throughout, I'd count you very lucky indeed! They were there with you to conceive the baby (in most cases, but not all), and they should be there with you to birth the baby. Your partner is your most trusted loved one who will be able to support you no matter what. You can depend on them and they will be there for you. Not everyone goes through this process with a partner though, and that's okay. For some, birth is a spectator sport. I remember my second client not only had her partner and I with her, but also her mother, and her mother-in-law! What a great little birth team we made! Be careful about deciding which friends and family you allow at your birth though. You wouldn't want anyone there who would make it about themselves, or offer unhelpful advice, or who would just be a bother. Not everyone hires a doula. I may be biased, but I believe everyone should. And yes, everyone can afford one. A doula will be there with you throughout your birth process and, unlike your loved ones, they aren't emotionally attached to you. We're still emotional people, no doubt. But we won't hate seeing you in a pain so much that we'll tell you to get an epidural even if you're against it. We want you to have your ideal birth and will do whatever is in our power to see to it that that happens. Interview a few doulas and hire the one you feel the best connection with, one who understands what you want and you get a good vibe form. Someone who you will want to soothe you when you're at your most vulnerable. Here's a big one. Many women don't actually look around for doctors and interview a bunch like they would with doulas. They usually just go with the first one they go to. Did you know though, that you have a say in the matter? If you're not jiving with your doctor, i.e they seem dismissive of you, don't provide enough information, don't have a great bedside manner, etc. then there's no reason that they have to be your doctor. Even if you've waited until well into the pregnancy, it's never too late to switch. You deserve to feel heard and respected, and anything less than that will not do. Who you choose to be at your side throughout your pregnancy and your birth plays a huge role in the outcome of the birth. Women who are supported and loved generally have shorter labours with less interventions than those without. Don't forget, this is YOUR birth. You call the shots. And that includes who you have around you.